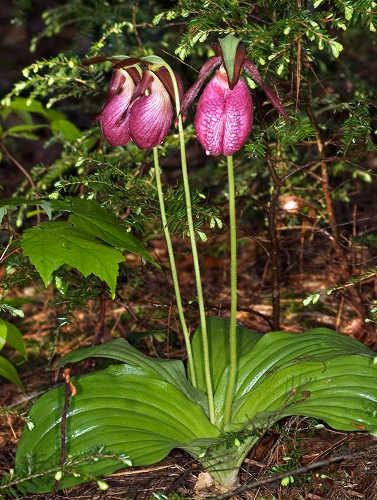 Anyone who grew up in the northern part of the USA is familiar with lady slipper orchids. As a child I was introduced to this group of plants when I came upon the moccasin flower, Cypripedium acaule, growing in the local woods of southern New York. Little did I know at the time that this species was just one member of a much larger group of plants known as the slipper orchids, subfamily Cypripedioideae. 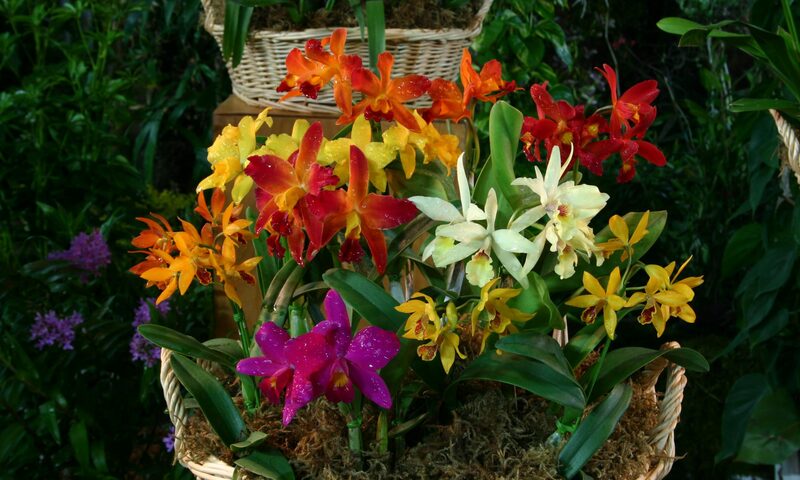 Nor did I realize they are some of the most primitive of the orchid family, so much so that some authorities have considered them a separate family of plants altogether. Variation within this subfamily is broad in many regards. They can be found growing in a wide range of habitats, from grasslands, to temperate forests, tropical and subtropical forests, and wetlands such as bogs or seepage slopes. Some are completely terrestrial, while others are epiphytic. Both life cycle and habit too are highly varied. Most are evergreen with the exception of the genus Cypripedium which is deciduous, however, as if to prove the variation of these plants, one species, C. subtropicum, is evergreen. The habit of the leaves and the flower scape as well ranges far and wide, though all are sympodial plants, throwing new growths along a trailing rhizome. So what makes them all slipper orchids? Mostly the characteristics of the flower. The most obvious common feature is the sac shaped lip, giving these plants their common name. Few other orchids have this feature, and none so developed. Moreover, the flower is graced with a staminode – a sterile, shield shaped stamen that covers the two fertile anthers as well as the stigmatic surface. The lip acts as a temporary trap for insects designed such that escape puts them in contact with the staminode, thus increasing the chance of pollination. 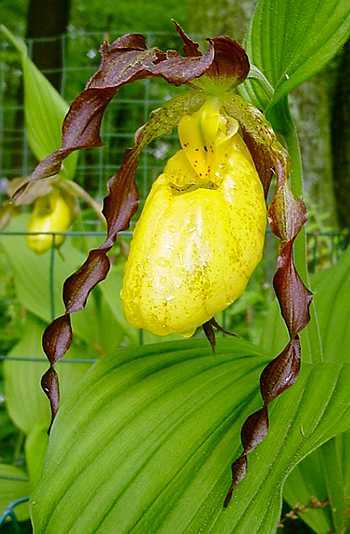 A few species of Cypripedium are autogamous – self fertilizing. Another feature common to most species is that the two lower sepals are fused into a single unit called the synsepal. Occasionally, these sepals are not fused, but that is the exception rather than the norm. The remaining sepal is known as the dorsal sepal and often is rather large. The petals are usually held laterally in most species, and in many are the longest flower parts. 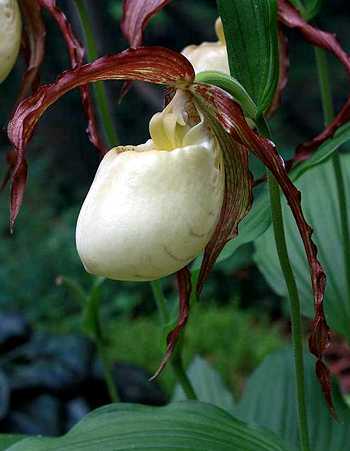 They frequently hang down, particularly in the genera Phragmipedium and Cypripedium, though certain sections within Paphiopedium have this feature as well. 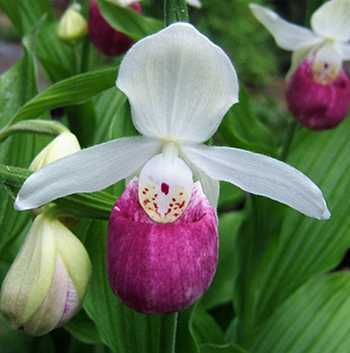 Cypripedium – this terrestrial genus composed of around 45-47 species is mostly found throughout the northern temperate regions of the world, but outlying species in Central America and southern China fall within subtropical or even tropical climates. They are deciduous in habit and largely woodland plants. Their cultivation is somewhat problematic. As fate would have it, they also are my favorite slipper orchids. 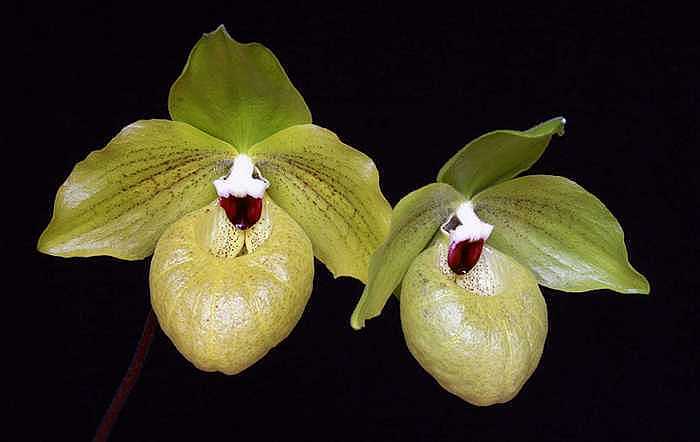 Mexipedium – a single dwarf species is known from Oaxaca, Mexico, M. xerophyticum. This lithophytic plant likes a bit more water in cultivation than its name implies. Phragmipedium – this tropical American genus numbering around 15-20 species is known for its love of water. Species range from epiphytic, to lithophytic, to terrestrial in habit. It is composed of six sections. The most astounding species to be found recently, P. kovachii, is in a section all its own. Paphiopedilum – this is by far the most varied group of slipper orchids, containing 80 or so known species, and is found only in southeast Asia and the East Indies. Five subgenera, 15 sections, and 4 subsections can be found within this diverse genus. They range from true epiphytes, to lithophytes, to terrestrial in habit. Most are found within the bounds of truly tropical areas, but some members of the subgenus Parvisepalum venture into distinctly temperate climes. This genus is the most widely grown and hybridized of all slipper orchids. 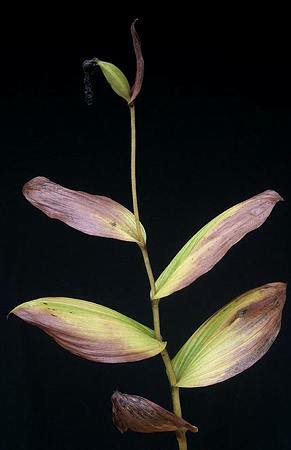 Selenipedium – an odd group of highly primitive plants, numbering only six species in all, and all confined to northern South America and Panama. Little is known about their culture outside their native lands. Most are quite tall, leafy plants, with relatively small flowers. Curiosities, but never likely to be important in the horticultural trade. 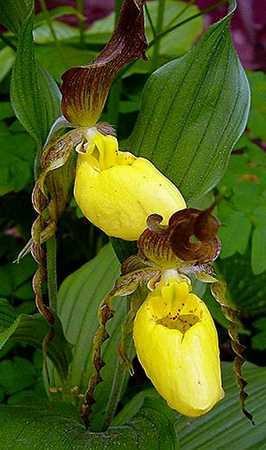 By far the most wide ranging Cypripedium in all of North America is C. parviflorum v. pubescens, also known as the large yellow lady slipper. It has been found in 42 of the lower 48 states in the US plus Alaska (missing only in California, Florida, Louisiana, Nevada, Oklahoma, and Oregon), as well as all of Canada’s 10 provinces and two out of three territories (missing only in Nunavut). This plant is wide ranging not only in physical space, but in appearance as well. Plants in the far north sometimes stand little more than hand high and bear dwarfed flowers with nearly perfectly flat petals, while those found in the rich forests of the southern Appalachian mountains can grow taller than an adult man’s knee and have flowers nearly as big as the same man’s hand if splayed out. Due to this extreme range across geographic space and habit it has been the most problematic North American Cypripedium to delineate into a clean category. This is compounded by its interaction and interbreeding with v. parviflorum, and where their ranges overlap, the separate species, C. candidum. Cypripedium parviflorum v. pubescens (hereafter referred to as v. pubescens) is a large deciduous, perennial, terrestrial orchid most commonly found in moist forests. Depending on where the plant is found growing, its height can vary widely, with flowering specimens standing little more than 12 cm tall and as much as 80 cm, nearly rivaling C. reginae in stature. Growth stems bear between 3-6 pubescent, ovate to ovate-lanceolate leaves, deeply ribbed, with each 6-20 cm long and 2-10 cm wide, and borne alternately off the stem. The vigorous root stock is like other Cypripedium species with a creeping, branched rhizome bearing numerous, creamy white to amber yellow non-forking roots that can exceed 40 cm in large specimens. In nature this plant can grow a single stem or be large clump numbering 20 or more stems, however plants with 3-5 stems is closer to the norm. Cypripedium parviflorum v. pubescens is a highly variable plant. While the stature of this specimen is very compact, the flowers are typical for the variety. Grown and flowered by Darcy Gunnlaugson. Flowers are borne at the top of the stem, usually singly, but occasionally in pairs. As its common name implies, they tend to be rather large with a natural spread up to at least 12 cm in larger flower forms, however the form planipetalum of the far north can be half that size. The dorsal sepal is large and broad, up to 8.5 cm long and half as wide, with a tendency to stand more or less erect, but sometimes overhanging the lip as in C. kentuckiense. It can be twisted at its end much like the petals, or be nearly perfectly flat depending on the plant. The synsepal is a bit smaller, and though it is held just off the lip’s surface, it curves to follow its contour. The petals are long and narrow, and again, depending on the form can vary widely in length, being as short as just 3 cm or as long as 9 cm, but rarely more than 1 cm wide. They tend to be presented at an angle of 45 degrees to the ground, but can hang lower. In most forms they are highly twisted, reminiscent of a spiral ribbon, though this can vary widely from plant to plant with some having extreme twisting and others much less. In the form planipetalum the petals tend to be presented almost at a perfect 90 degrees relative to the ground and have little or no twisting. The lip is large, up to 5 cm long, and tends to be ellipsoidal in shape, however some plants have more rounded lips. The staminode is triangular in shape with rounded corners and is held tightly over the column underneath. This plant of v. pubescens originates from the Blue Ridge Mountains of Virginia. Its flower is darker in color than the norm with highly twisted petals and dorsal sepal. Grown and photographed by Paul Perakos. Surely the most resplendent of lady’s slipper orchids in North America is the aptly named showy lady’s slipper, Cypripedium reginae. It is a rare, yet locally abundant plant of swamps, bogs, and wet woods throughout the northeastern quarter of the US as well as adjoining areas of Canada. Even as little as 50 years ago it could be seen over much of the midwest and northeastern states, with some populations numbering into the many thousands of flowering stems, but sadly the plant is now endangered or on the verge of extinction in many areas. Reasons vary, however modification of habitat and an exploding deer population probably figure in strongly for the losses over the past half century. Luckily, breakthroughs in seed propagation since the mid 1980s have made this plant fairly common in the horticultural trade, so the plant’s future seems secure, at least as cultivated stock. Cypripedium reginae is one of the biggest of the cold growing Cyps, standing nearly up to a meter tall. These plants were grown and photographed by Darcy Gunnlaugson. 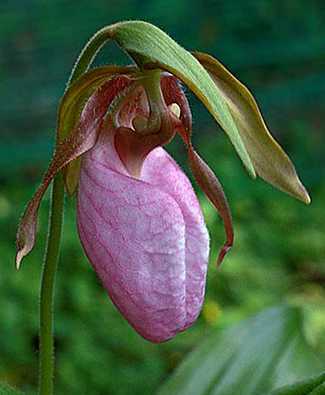 Cypripedium reginae is a large herbaceous, deciduous, perennial, terrestrial orchid of wet habitats. The thick, thumb sized growth buds poke up a bit later than most other species of Cypripedium, and over a month’s time can grow into plants approaching a meter tall. It’s stem typically is a bit shorter, between 40-75 cm on average, and supports between 3-7 highly pubescent leaves. The leaves are borne alternately off the stem, are somewhat elongated, yet generally ovate, and deeply ribbed. The stem and leaves are highly hairy and can cause allergic contact dermatitis if handled. The root stock consists of a branching, thick rhizome with many cream to white colored roots that can grow over 70 cm in length. When happy this species can form clumps over 50 flowering stems, something that is almost hard to imagine. Flowers are borne at the apex of the growth stem, as many 3 per stem (rarely 4), and each is accompanied by a floral bract. The flowers are, like the rest of the plant, large in size with a natural spread up to 10 cm from petal tip to tip. The dorsal sepal is broad and stands more or less erect, growing up to 5 cm long and ovate with a rounded tip. The synsepal has a similar shape, and is perhaps a bit smaller in size. The petals are elongate and fairly narrow, growing up to 4.5 cm long and under 2 cm wide. They are held flat (sometimes slightly recurved) and nearly parallel to the ground. The lip is round, though somewhat elongated, like an egg. It’s orifice can vary from being quite wide to small . The staminode is broad and like the dorsal sepal is ovate, fully covering the column. The thing that makes this flower so singular are its colors – truly those of a queen. The dorsal sepal, petals, and synsepal are absolutely pure white, and I do mean pure white. The lip has a white base color and is suffused with purple-pink – sometimes as a light blush, sometimes so thick that it seems entirely deep purple, but often this flushing is in parallel lines creating an alternating purple and white striped pattern. The staminode as well is pure white and typically has yellow blushing on its lower half accompanied by purple-pink blotches and spots. Pure alba forms exist as well. Flowering commences in mid June and can extend into July in the far north of its range. Interestingly, flower color can vary widely from year to year and this appears to be dependent on ambient temperatures with cooler conditions producing richer casts. The flowers of Cypripedium reginae sometimes have very darkly pigmented lips such as this plant. Grown and photographed by Darcy Gunnlaugson. The first wild orchid I can remember seeing as a kid growing up in southern New York State was the moccasin flower, Cypripedium acaule. This odd, yet striking plant, has become a symbol for wild and endangered plants in its native homeland. For years I held onto that idea, but like many childhood ideas, it became apparent after seeing literally countless plants from one end of the Appalachian Mountains to the other, that this was not a plant in trouble. Indeed, it is possible that the overall wild population today is actually larger than in pre-columbian America, an idea I will support later in this article. 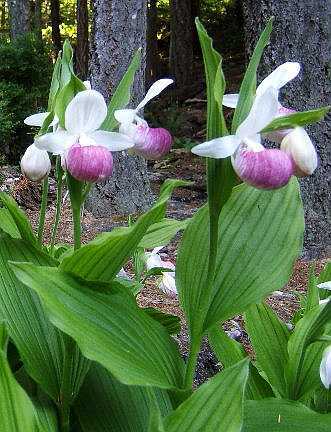 Cypripedium acaule is an herbaceous perennial terrestrial orchid of bright woods. The two broad apple green, deeply ribbed leaves are born essentially opposite each other on a very short stem, giving them the impression of springing directly out of the ground. Plant size can vary widely with some adult specimens having leaves scarcely more 8 cm long each, and perhaps half as wide, while vigorous ones can have leaves up to 30 cm long and again, about half as wide. They grow from a short, underground, creeping rhizome that also bears many white, branch less, and fleshy roots typical of other members of the genus. 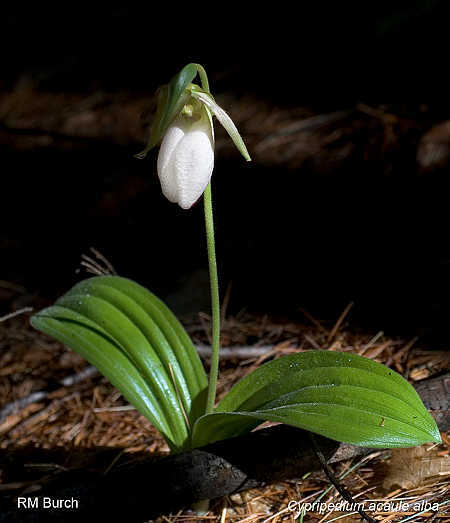 The lovely pure white flower of Cypripedium acaule v. alba growing in its native pine woods of northern Connecticut. Photo by Ron Burch. In fertile plants a flower stem rises from between the two leaves to a height of 15-45 cm. At its terminus is a floral bract, quite reduced in size and narrow, but otherwise similar in appearance to the leaves, cradling a single flower (double flowers are very unusual). The entire plant, and indeed the flower itself, is highly pubescent. Like the leaves, the flower can vary in size a great deal. I’ve seen flowers with a natural spread of little more than 6 cm and others double that size, though they usually are somewhere between those extremes. The flower would be rather subdued if it weren’t for its lovely pink lip. The dorsal sepal is the largest flower part other than the lip, growing up to 5 cm long and 2 cm wide, and over arches the lip. The synsepal is a about the same size or just a bit smaller, and unlike other species of the genus, is held away from the back of the lip. The petals are long and narrow with just a sight twist, are held more or less at a 45 degree angle to the ground, and are between 3-6 cm long. Like the rest of the flower, they are covered in fine hairs, however these can be rather long near their point of attachment to the ovary. The dorsal sepal, synsepal, and petals all share a similar color pattern – a base color of green and suffused with varying amounts of brownish purple. Typically the petals are a shade darker than the the dorsal sepal and synsepal. The staminode is a bit brighter, but otherwise similar in color. Luckily, the lip saves the day and in the end steals the show. Looking at it, you can see why the plant got the name moccasin flower since the bilaterally split and inflated lip truly does have a moccasin shoe shape. This lip design is unique in the genus with only C. japonicum and C. formosanum looking remotely similar, and yet neither of those species possesses the vertical cleft of C. acaule. After seeing the plant for the first time, a friend of mine dubbed it “the pink testicle plant” – a humorous, yet disturbing name that I try to dissuade him from using since it messes with my sensibilities! The lip’s base color is pure white, and yet is so suffused with pink flushing and purple-pink striations that the overall effect is a pink to raspberry pink color. Again, variation is wide – some flowers are just a very pale pink, while others have a much deeper cast. The front of the flower near the cleft is often quite white and deeply striated with purple-pink. Very occasionally, a true alba flowered form can be seen with a pure white lip and green sepals and petals. The moccasin flower is at home over much of the temperate and boreal forest regions of eastern North America, being found from the Canadian provinces of Newfoundland, Nova Scotia, New Brunswick, southern Quebec, southern Ontario, south-central Manitoba, northern Saskatchewan, to the extreme northeast corner of Alberta, and in the US from northeast Minnesota across the northern tier to Maine, and southward to the northernmost parts of Illinois, Indiana, and Ohio. Along the eastern seaboard it is found throughout all of New England, New York, and the mid-Atlantic states, as well as the Appalachian Mountains southward to the northeast corner of Alabama, northern Georgia, and northwestern South Carolina. It can also be found on the coastal plain and Piedmont of Delaware, Virginia, and North Carolina with extreme outlying populations in South Carolina (Richland, Lexington, and Georgetown Counties). Occasionally very deep colored flowers can be seen – they stand out in a colony from a great distance. Photo by Ron Burch. For those of us who simply won’t be stopped from having plants we shouldn’t be growing given the local climate, the “pot in pot cooler” method is a perfect solution. Well, not really, but it is a good excuse to try plants we should pass over. In my case that includes most of the genus Cypripedium, to which I have a hopeless attraction. This article explains the method I’ve used with a modest amount of success in growing Cyps in a climate that nearly approximates Charleston, South Carolina, U.S.A. When I moved to southern Japan from Florida 10 years ago I had high hopes to be able to coax some of the warmer growing Cypripediums to live in this nearly subtropical climate. In the beginning the failure rate was high, but over time I managed to figure out a method that seemed to work pretty well – the so called “pot in pot cooler” (a variation of a zeer pot refrigerator). What follows is a step by step explanation of this method and materials needed for this approach. The problem at hand are Cypripedium roots – except for the hot growing outliers, C. subtropicum and the Mexican species, all Cyps are temperate slipper orchids and need cool roots. Any sustained temperature above 25 C is detrimental to Cyp roots, opening them to infection or simply stopping their growth. It is important to note that it is the roots that need to be cool, not necessarily the plant itself. Cryptomoss is a product made from the ground up bark of Japanese cedar trees. It is water conductive as well as “airy” – a perfect combination for growing Cyps using the pot in pot cooler method. C. californicum for instance grows in seepage bogs where the substrate never goes above 20 C, but the plants themselves often endure temperatures well above 30 C. Similarly, cool loving species such as C. arietinum and C. reginae are found in bogs and wetlands in the southern reaches of their ranges. While people have mistaken this to mean they like wet conditions, what they really need are cool roots, and bogs make great evaporative coolers. So, let’s see how we can artificially create our own cooler. The idea of a pot in pot cooler is to create conditions so that the evaporation rate off the pot containing the plant is as high as possible – the more evaporation, the cooler the pot. This necessitates the use of pots made of porous material such that water can migrate from the inner wall of the vessel to the outer easily, thus evaporating once hitting the air. Common, unglazed clay pots fit the bill quite nicely. Choose ones that are a bit larger than necessary to accommodate the plant – Cypripediums like to be over-potted. Other materials you’ll need include horticultural wicking tape (usually sold in rolls and commonly used for growing African violets), a fairly deep (6-8 cm) dish, and chunks of natural charcoal (optional). The next important issue is what compost should be used – it has to be proper for the plant, wick water easily, and be airy in structure. Porous inorganic materials such as pumice, baked clay, perlite, as well as any number of soil amendments used to lighten mixes (e.g. Soil Perfector, Sermis, etc.) can be used in blended or pure form. Organic materials that don’t break down quickly and conduct water easily can also be used. Here in Japan a material made from the shredded bark of Japanese cedar (Cryptomeria japonica) is commonly available and known as Kuriptomosu (Cryptomoss). Many Cypripedium growers use this product exclusively since it promotes healthy roots and can be used in pot in pot coolers. Do not use chipped wood products, peat moss, or any typical soil. 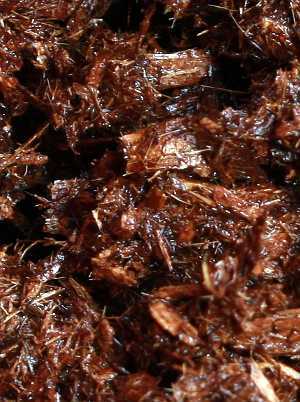 If you live in the USA, cypress mulch made from bald cypress bark (Taxodium distichum) should work provided it doesn’t include wood chips, just the fine, shredded bark. Coir (material made from the husks of coconuts) is also another possibility and has the added bonus of being eco-friendly and available world wide. 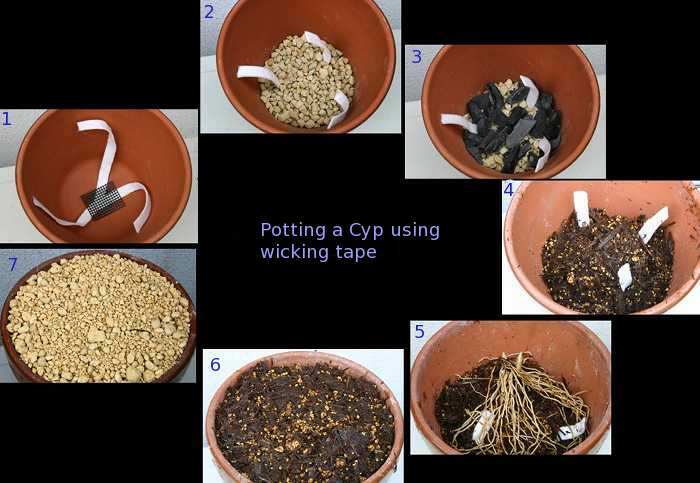 Figure 1: step by step, the method for potting a Cyp using wicking tape. New Paphiopedilum hybrids with one or more parents from the subgenus Parvisepalum have been increasing in number steadily since the 1990’s, such that today they have become common in slipper orchid collections. Until fairly recently relatively few complex hybrids have been made with members from this subgenus, however that has been changing year by year. 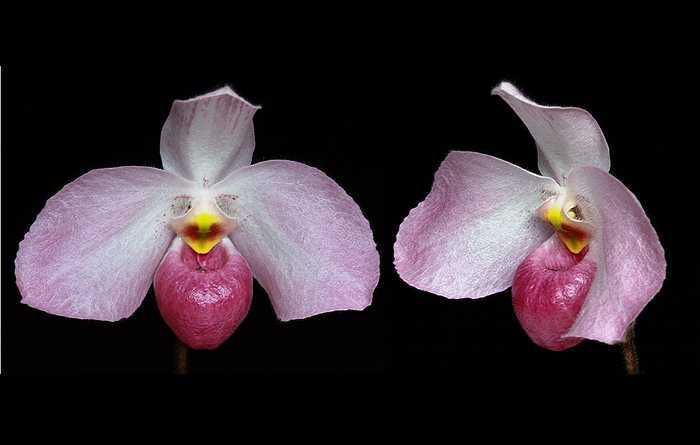 This article focuses on three complex Paph hybrids that include the green flowered species Paphiopedilum malipoense. Paphiopedilum malipoense (upper) and P. Norito Hasegawa. collected and exported out their native China to flower markets around the world. P. Norito Hasegawa in turn was one of the first Parvisepalum hybrids used to make the first complex Parvisepalum hybrids. Back in November 2004 I met Norito Hasegawa at the Orchid Expo in Fukuoka City, Japan. He of course is the famous Paph breeder that the above mentioned primary cross was named after. Being an amicable guy, he managed to talk me into buying a couple strong sub-adult plants – the first string of new hybrids he made using P. Norito Hasegawa as a parent plant. I have grown and flowered them ever since. The first cross is P. Norito Hasegawa x P. malipoense fma. ‘album’. The ‘alba’ form of P. malipoense isn’t exactly white, in fact it is pure light green with none of the typical burgundy markings found normally on that flower – not even the staminode has a touch of it. As might be expected the cross of this plant looks much like a pure P. malipoense flower, but it is a bit more yellow as it ages – an effect of the P. armeniacum blood. None of the light coloration of the ‘alba’ parent was preserved. While this hybrid is not remarkably different then P. Norito Hasegawa itself, it is nonetheless a lovely flower. Only three species of Paphiopedilum within the subgenus Parvisepalum boast pink flowers – P. delenatii, P. micranthum, and P. vietnamense. 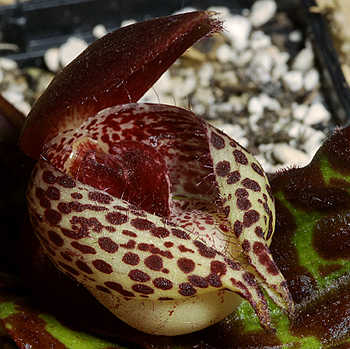 P. delenatii has been has been used to make a wide number of primary hybrids with other Paphiopedilum species, and are the focus of this article. All the plants mentioned here I have grown and flowered at my home in southern Japan. 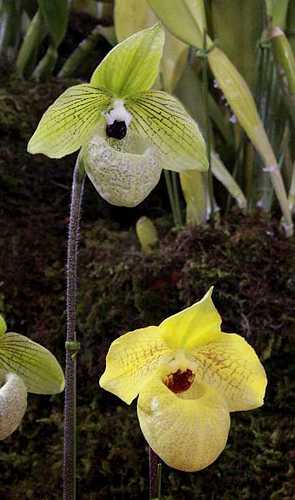 Paphiopedilum delenatii – one of the parent plants of all the mentioned hybrids in this article. Most species within this subgenus live in northern Vietnam and adjacent areas of China. The exceptions are P. vietnamense which is found in a very small area in the northern mountains of Vietnam, and P. armeniacum, confined to a small area of Yunnan near the Myanmar border. By contrast, P. delenatti is found only along the southern coastline of Vietnam. The upshot is that all in the group can endure colder temperatures in winter, while P. delenatti is a truly tropical plant. The earlier primary hybrids with P. delenatii were made from the progeny of one famous plant grown by Marcel Lecoufle. In the last 20 years, with the rediscovery of this species in southern Vietnam, its hybrids have become more diverse and available. One interesting feature of many its hybrids is the tendency of nearly all white flowers resulting, a sort of “bleaching out” of the purple, yellow, and green pigments. A good example of this is P. Armeni White where the yellow pigment of P. armeniacum are virtually lost. The yellow on the staminode of P. delenatii appears on its hybrids as well. Without further adieu, here are the P. delenatii primary hybrids I’ve grown over the past 7 or so years. First off is P. Ho Chi Minh (Popow, 2002), a hybrid made with the closely related species, P. vietnamense. The flower is quite large, up to 10 or more centimeters across. My plant opens relatively flat, but then gets more cupped within the first couple days. While many people complain this hybrid’s flower lasts a very short time (some report a week or less), my plant keeps it’s blooms for three weeks on average. It is a annual bloomer for me, but increases its number of growths slowly. The next three hybrids all show the above mentioned “bleaching effect”. The first is one of my all time favorite Paph hybrids, P. Armeni White (Kubo, 1987), a cross with the pure yellow flowered P. armeniacum. The flower initially is somewhat cupped and creamy yellow, but within a few days bleaches nearly pure white, except the staminode which is yellow and marked with brick red. As the flower matures it also tends to open more and the petals and dorsal sepal become more wavy. Perhaps no other group of terrestrial orchid is as popular as the lady slipper orchids, genus Cypripedium. As I said in my articles about Cypripedium cultivation, relatively few species are in mass production, so many on the market today are wild sourced plants. While some condemn this practice, I am not here to do so, I only want to address the issue of how to recognize a healthy plant to insure success for the buyer. Necessarily, many wild collected Cyps are not in good health due to rough treatment during collection, poor storage before going to market, and the process and time involved in transporting them to their new homes. 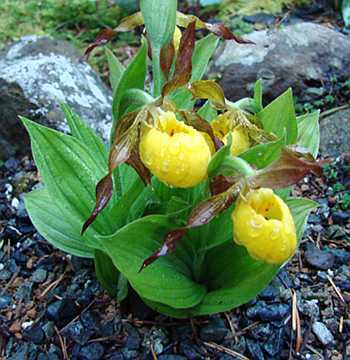 We all want to have healthy Cyps in our gardens such as this lovely Cypripedium tibeticum in Darcy Gunnlaugson’s garden in Canada. To have such a plant though it needs to have healthy root stock. Moreover, it should be noted that while the mortality rate of wild collected material is often high, plants can be stabilized over time in culture and in time look like nursery propagated stock. 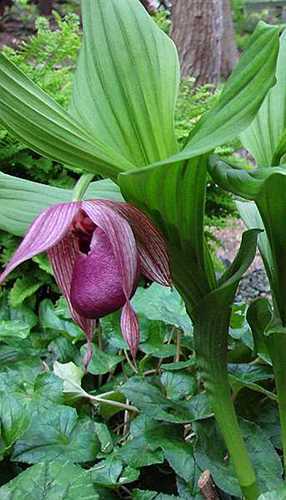 Since the purpose of this article is to recognize the indications of health of a Cypripedium, that will be my main focus. The characteristics of an unhealthy plant indeed are often due to the collecting process, so it is important to know what those characteristics are, and if at all possible, avoid purchasing such stock. Of course not all collected material is in poor health, however the lion’s share is in my experience. Furthermore, this article is about mature plants, not seedlings. Usually seedlings are sold soon after being removed from their propagating jars (commonly called deflasked seedlings) and are very small. Once you have seen deflasked Cypripedium seedlings it is impossible to mistake wild collected material with them. Still, some vendors market very small collected plants as “seedlings” – a questionable practice since such plants have an even higher mortality rate than adults. The roots of a healthy Cypripedium are light in color, not broken or cut, and the root tips are intact. These roots exemplify all those attributes. 1. The roots should be clean looking, white to cream colored, with little or no black on them, particularly the root tips. Some species can have brown roots due to heavy organics in the compost staining them, but most will not have this. Recently collected plants will rarely have light colored roots, even if they are undamaged, but rather moderately dark to dark brown roots. Unhealthy plants will have black roots and many will be dead or dying, the result of invading organisms – fungi and bacteria. 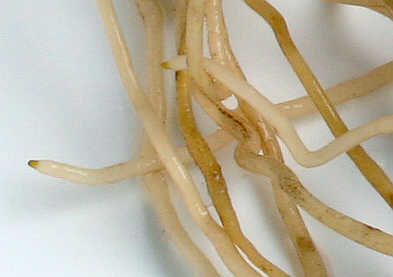 Another problem are clean looking roots that break off easily from the rhizome during handling. While it is normal for a few roots to come off during transit and planting, most should be firmly in place. 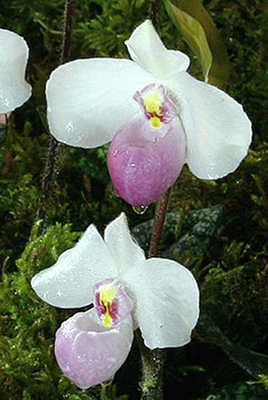 As you can surmise from these entries, many Cypripediums have yet to be artificially produced in large numbers, especially by means of micropropagation techniques. Of the 59 species, recognized varieties, and naturally occurring hybrids listed here, only 14 of these have been propagated in any quantity over the last two decades. Moreover, 11 of these are either from the subsection Cypripedium or are hybrids of that subsection, and out of those, three are varieties of one species, C. parviflorum. Clearly, this group is the easiest to cultivate with known propagation techniques. Indeed, only 3 species outside this subsection have been mass propagated to adult size, C. californicum, C. guttatum, and C. reginae. In truth, of these only C. reginae has been truly mass produced to date. Regardless, lady slipper orchids remain some of the most sought after of all terrestrial orchids to this day – hence, there is a big disconnect between demand for them and the supply. The most widespread of all the North American Cyps is Cypripedium parviflorum v. pubescens. It is one of the easiest species to grow. Grown and photographed by Paul Perakos. So, this begs the following questions, why is this the current situation and where are plants in cultivation coming from? The second question is easy to answer – many if not most are coming from the wild. The first question is more difficult. The bottom line is that most species are either tricky to germinate and/or they do not grow well afterwards. Others are simply slow growing, taking many years to bloom. Still others have high mortality rates from seed to adult size. The simple truth is that before 1990 only a handful of expert growers such as Carson Whitlow and Werner Frosch were even attempting Cypripedium micropropagation. In the mid 90s that began to change with quite a few growers world wide getting in on the game. Dr. Bill Steele helped wax the wheel by making his nutrient formulations free and public to all. By late in the decade many thousands of Cyps, both naturally occurring and artificial hybrids, had been produced and sold. Recently, the focus of many propagators has been on artificial hybrids since they offer more variety and most are much easier to grow than the species. The upshot is, there is still a lot of work to do in effectively growing most of the known Cypripedium species. For these reasons and others, Cyps remain a niche market in the horticultural trade. This situation also brings the inevitable – high prices for even the easiest and most commonly produced plants. All of this goes beyond the scope of this article though, so perhaps this discussion should handled at another time. japonicum – a widely kept species that remains difficult to grow and apparently very difficult to flower even after being firmly established. It is found throughout much of central China, the Korean Peninsula, and virtually all of Japan. As such it is fairly indifferent to temperatures enduring both severe and mild winters, and cool to very warm summers. It needs a lot of room to range since the distance between growths can be 15 centimeters or more. It is completely intolerant of dry conditions and is also a heavy feeder. Best grown in the ground in acidic conditions in a decidedly organic compost. Production from seed has been very difficult, so plants in the trade are virtually all wild sourced. When happy it forms formidable colonies with thousands of flowering stems. Not an easy species. USDA zones 4-9. Cypripedium lichiangense is perhaps one of the most spectacular of the spotted leaf Cyps. Grown and photographed by Rogier van Vugt. The following is a list of all known generally accepted naturally occurring lady slipper orchids, genus Cypripedium, and their cultivation status. No doubt in the coming years more hybrids will come to light, especially from China’s vast western mountains. Each year new plants are being found there that suggest hybrid origin, but as yet remain undescribed by science. There indeed is even a chance that a few unknown species yet reside there, tucked away in some inaccessible niche. The focus here is on Cypripedium availability on the world market, how challenging their cultivation has proved, what their specific needs are, and where plants have been sourced to date. Since information is constantly changing and many growers are tight lipped about their doings, the following cannot be inclusive of all plants in cultivation. What is offered is a product of my own discussions with growers, scientists, “stuff off the grape vine”, and my own personal experience. I have avoided addressing the legality of any particular species, but suffice it to say that many plants have made it into the trade via illegal smuggling. This leaves a big question mark on the status of plants in countries that are signees of CITES since all are covered under this treaty. 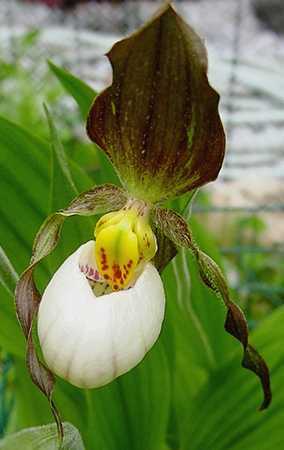 Cypripedium acaule – one of the most unique and difficult to grow ladyslippers. The USDA zone recommendations given are not to be taken as a strict guideline. In cooler summer climates such as the Pacific Northwest of the USA or most of the British Isles, many species can be grown even in what qualifies as zone 9. Like other temperate terrestrial orchids, Cypripediums as a rule do not like hot roots, so areas with hot summer nights are unlikely to be good places to grow any of them, but a few might persist if grown optimally. So, without further adieu, here is the first half of the list. The names highlighted in blue are clickable links to more comprehensive pages about that plant. acaule – this species is widely cultivated from both wild and artificially produced plants. This plant cannot grow in typical garden soil, requiring very high acidity (pH <4.5). Sandy, open, pine humus rich composts have been effective, but still have to be watched very carefully for increases in pH. The best method devised so far is watering regularly with a solution of acidified rainwater (household vinegar is fine – 1 or 2 teaspoons per gallon). Use only clean rainwater, RO water, or distilled water since the plants cannot endure salt build-up in the growing medium. Avoid planting in the ground in regions with sweet soils since keeping pH down is nearly impossible. If fertilizer is used, use a very dilute solution or add nutrients via natural matter such as composed pine needles. A very difficult plant to maintain in the long term even within its native range, but possible. USDA zones 2-7.
x alaskanum – the natural hybrid of C. guttatum and C. yatabeanum from the Aleutian Islands of Alaska. Grow as per C. guttatum. Occasionally offered. USDA zones 2-5. Cypripedium x andrewsii – an easy to grow natural hybrid between C. candidum and C. parviflorum v. parviflorum. Grown and photographed by Paul Perakos. x andrewsii – the natural hybrid between C. candidum and C. parviflorum v. parviflorum. Seems to enjoy quite a bit of sun, at least in the morning, and any near neutral soil will do nicely. Widely cultivated from lab propagated plants. Easy. USDA zones 3-7.
arietinum – widely cultivated, but difficult and rare. Sandy compost with conifer humus will do provided it remains open and free draining. Acidity should be between pH 5 to 7. It is susceptible to rots, so avoid saturated conditions. While it is very cold tolerant, it is also incapable of enduring long periods of summer heat. Plants tend to reach flowering age much quicker than most species or hybrids. USDA zones 2-5.